Prior to its gallery release in February 2012, CWF is proud to offer its membership this exclusive limited time opportunity to own a special edition, Robert Bateman limited edition print. All proceeds from the sale of “The Moose Family” will go to CWF Education programming. Limited edition canvas giclees $895. The Canadian Wildlife Federation is helping to protect the future of our natural heritage for your children and grandchildren to enjoy. When you buy a gift from the Canadian Wildlife Federation you are giving to wild spaces and species. 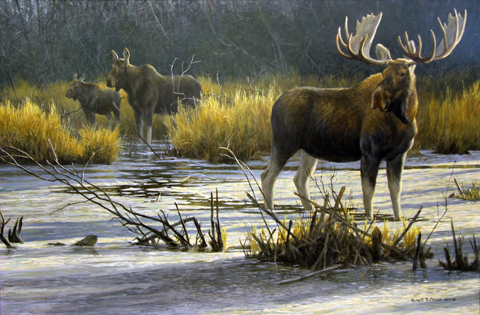 Meet renowned artist Robert Bateman at the Robert Bateman, Fall Tour: Ontario 2011!